Are you willing to go into debt for love? If you are ready to pop the question, but haven’t saved for the ring you want to buy, you may be tempted to finance the purchase. But do that, and you may find that already pricey engagement ring costs a lot more than you planned. The average engagement ring cost $5,200 and about 12% of couples spent more than $8,000 for an engagement ring, according to the XO Group Inc. 2011 Engagement Engagement & Jewelry Survey. The average ring was 1 carat for the center stone, and 1.4 carats total stones. If you haven’t socked that much away, don’t worry. All of the major jewelry stores offer financing, with many of them promoting interest-free financing for six to 12 months. (No interest, no payments is no longer allowed thanks to the CARD Act). But there’s a catch: miss a payment or fail to pay off the balance and you’ll pay a lot more. For example, here is what some of the major jewelry stores are currently advertising*. With all of these plans, if you make one late payment or fail to pay the balance in full during the promotional period, interest will be charged from the date of purchase — not from the date the promotional period ends. Jared: 0% interest if paid in full within 12 months; up to 24.99%. Kay Jewelers: 0% interest if paid in full within 12 months; up to 24.99%. While interest-free financing may work out fine if you are able to pay off the balance, it is risky if you aren’t able to come up with the cash to pay it off. One more potential trap: Applying for one of the accounts will create an inquiry on your credit reports. Plus, if you accept the financing, you’ll have a new account with a balance listed on your credit reports, and that could potentially have a negative effect on your credit scores. That’s something to keep in mind if you hope to buy a home together soon, for example. Buy a less expensive ring and start saving for an upgrade on, say, your fifth or tenth wedding anniversary. Use interest-free financing for the initial purchase, then use a low-rate balance transfer to pay off the balance before the 0% store financing ends. I am not recommending this, since you can run into traps here too, but if you pull it off, it’s better than paying 25% or more for long-term store financing. Get a part-time job in a jewelry store and save substantially on your purchase. Put all of your earnings toward a ring. Buy Shy and Save: Shop for diamonds that weigh just under certain weight thresholds. For example, if you want a 1.0 carat diamond, you can buy a .90 carat diamond and save more than $1,000. And buying shy will hardly affect the diamond’s outward appearance (the diameter of a 1.0 carat diamond is 6.5 mm, whereas the diameter of a .90 shy carat stone is 6.3 mm — the difference is the thickness of a piece of paper). The price difference between a 1.90 carat diamond and a 2.0 carat diamond can be as much as $5,000! Hit the Internet: There can be some great deals found on the Internet — i.e. BlueNile and Union Diamond allow you to compare the going rate of loose diamonds and ring settings based on their grades and styles. 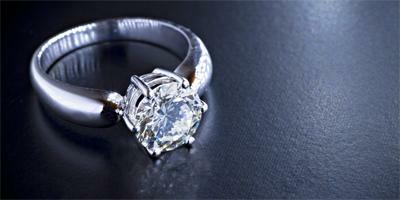 Buy Loose Diamonds: Don’t be dazzled by the pretty setting, the fancy box or the clever advertisements. Most jewelry ads are selling you on settings, not diamonds, even though the stone is a whopping 90 percent of a ring’s cost. It’s important to buy the stone loose, not mounted, so you can inspect the entire stone. Don’t be Afraid to Negotiate: There’s always room for negotiation, so don’t be afraid to go after a deal. Never settle on the sticker price unless you’ve shopped around and you know it’s already a fair price. Keep one more thing in mind before going into debt for an engagement ring: You’ve got a much bigger expense coming up soon — a wedding. *This information may have changed from the date of publication. See each jeweler’s website for current rates and promotional offers. Does Calavo Growers, Inc. (NASDAQ:CVGW) Have A Particularly Volatile Share Price?